To coincide with NSW Seniors Festival, City of Canada Bay Heritage Society will be presenting a ‘Virtual Tour of Yaralla’. The presentation explores the fascinating story of Yaralla from the original land grant to Isaac Nichols through the ownership of the Walker families to its contemporary use as a health facility. The presentation includes many rarely seen early photographs of Yaralla. The ‘virtual tour’ will be held at the City Canada Bay Museum on Saturday, 9 April 2016 at 2pm. For those interested in seeing the Yaralla Estate as it is today, City of Canada Bay Heritage Society will be hosting an open day on Sunday, 24 April 2016. Bookings can be made online. A large enthusiastic crowd greeted the arrival of the United States Navy’s Great White Fleet when it arrived in Sydney on 20 August 1908. Some months earlier, on 16 December 1907, President Theodore Roosevelt dispatched sixteen new battleships of the United States Atlantic Fleet on a peacetime goodwill tour of the world. The fourteen-month long voyage was to cover over 69,000 kilometres and visit twenty ports on six continents. The ships were painted white to signify the peaceful intention of the mission. At Five Dock, as land was being subdivided for new houses, the event was marked by naming four of the streets after ships of the Great White Fleet: Connecticut, Minnesota, New Jersey and Illinois. 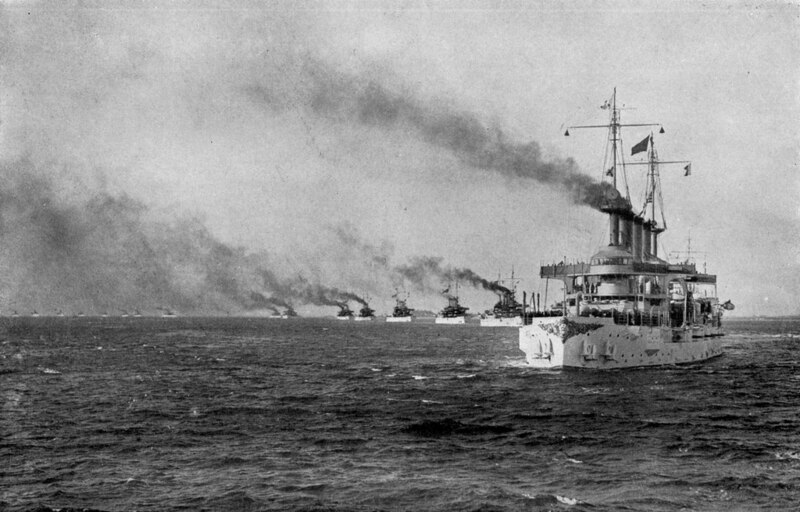 The photograph shows the Great White Fleet at sea, led by the Fleet’s flagship USS Connecticut.